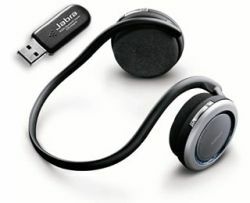 Jabra BT620s is a Bluetooth wireless stereo headset for mobile phones, music players, PCs and other Bluetooth devices. Jabra BT620s is especially powerful is the mobile phones or Bluetooth devices supports A2DP for advanced audio (stereo), AVRCP for remote control and Bluetooth headset and hands-free profiles, where the music pauses/stops automatically when a call comes in on your cellphones. Jabra BT620s can connect to various Bluetooth devices, enabling music playing and phone connectivity at the same time. Other features include music player controls on right speaker, volume control and phone controls on left speaker, digital sound enhancement via DSP technology, multi-colored LED for status on Bluetooth, battery and charging and ability to play music via USB cable when charging.